The end is near for much of the political leadership at the Colorado State Capitol. The state’s term limits law means 2018 will be the final legislative session for the speaker of the House, the Senate president and Gov. John Hickenlooper. Hickenlooper, a two-term Democrat who also served twice as Denver mayor, has sought to govern from the center during his years at the helm in Colorado. But common ground between the two parties will be difficult to find during his final legislative session, particularly because 2018 is an election year. It will be the fourth straight year of a one-vote Republican majority in the Senate and a more substantial Democratic advantage in the House. Divided control of the legislature means big plans are hard to achieve. Legislators should have little trouble finding bipartisan cooperation for minor bills that tweak the way government runs. But headline-making proposals on topics such as transportation funding and health care tend to fall victim to partisan gridlock. That said, the substance use crisis may present the best opportunity for bipartisanship. A record 904 Coloradans died of drug overdoses in 2016, more than half from opioids, and concern about the problem has been building. A bipartisan committee worked long hours last summer and fall to offer legislators six bills designed to curb the effects of the drug epidemic. But Washington politics will bring another year of uncertainty to the state, especially surrounding health care. The Trump administration struggled in 2017 to translate its goals into policy, as evidenced by the failure to repeal the Affordable Care Act (ACA). But the White House brushed aside legislative setbacks and turned to executive action to roll back key features of the ACA and shorten the enrollment period for private insurance. And Congress ended the year by repealing the individual mandate as part of the tax cut bill. Meanwhile, the political parties already are fixated on the November elections, which will see control of Congress, the Colorado legislature and the governor’s mansion up for grabs. Many of these dynamics could combine to make 2018 a year of marking time. The race for governor is especially important. Both parties have a large field of politically diverse candidates, so the outcome of the election could set a new direction for Colorado and for the identity of the Republican and Democratic parties in the state. So, even if the legislature fails to accomplish much in 2018, it will be a consequential year for the future of the state — and the health of its residents. Colorado’s 2018 governor’s race features the most competitive field of candidates in recent memory. Each party has five candidates with the funding and organizational strength to make a credible run. The winner can set a new direction for Colorado, so the state could swing significantly to the left or the right. 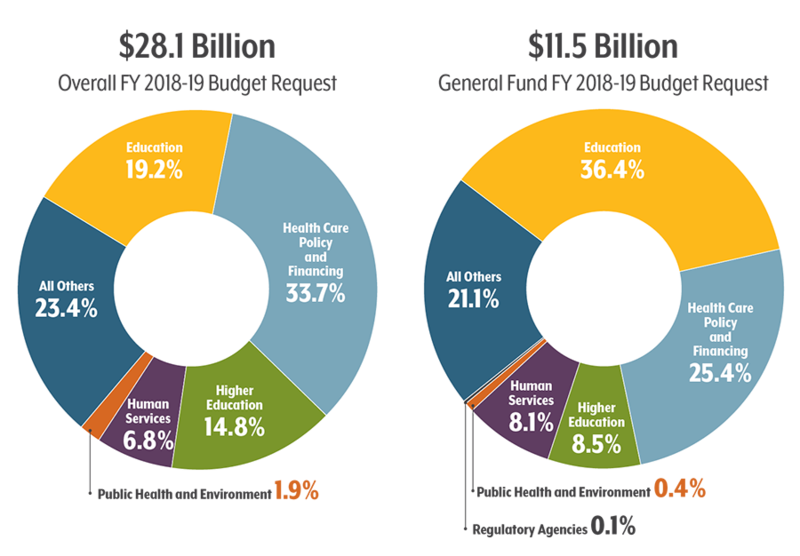 The new governor will have a powerful influence over spending priorities, the future direction of Health First Colorado (the state’s Medicaid program), and public health initiatives such as immunizations, birth control and health surveys. The race also will influence the direction of Colorado’s political parties. Both major parties are undergoing an identity crisis. A large activist wing of the Democratic Party is eager to turn the page on the centrist, pro-business policies of the Hickenlooper administration and embrace a more progressive agenda. Republicans, meanwhile, are deciding whether they want to be the party of President Donald Trump. Trump did worse in Colorado than the 2012 Republican candidate, Mitt Romney, especially in the party’s strongholds in suburban Denver and Colorado Springs. But Trump outperformed Romney in rural Colorado, a result that shows the state’s famous urban-rural divide exists inside the GOP as well. Control of the legislature is up for grabs, too. Democrats hold the House by a 37-28 margin, but Republicans control the Senate by just one seat. Democrats are aiming to beat Republican incumbents in close districts, such as those in Jefferson and Adams counties, to reclaim the Senate majority for the first time in four years. March 6: Precinct caucuses for party activists: The first step to becoming a delegate to the state convention. March 20: Deadline for candidates to submit petitions to be included on the primary ballot if they don’t want to go through the state convention. April 14: Last day for political parties to hold state conventions. Candidates need support of at least 30 percent of the delegates to win a spot on the party primary ballot. June 26: Party primary election day. Winners of the primary get their party’s spot on the November ballot. October 15: Mail ballots sent to voters. The legislature’s 2018-19 budget debate could be the least painful since the 2007 recession. Colorado’s economy ranks among the nation’s healthiest, and its budget is recovering from the aftershocks of the recession. Legislative economists project the state’s general fund will grow by about $750 million, or 6.7 percent. That gain is three times as large as the projected budget expansion at this point one year ago. The legislature gave the budget more breathing room in 2017 by passing Senate Bill 267. The bill removed Hospital Provider Fee dollars from the revenue cap instituted by the Taxpayer’s Bill of Rights (TABOR), which requires that excess revenue be refunded to taxpayers. The removal of the provider fee means Colorado is not expected to exceed the cap for several years, which leaves more money in the budget for items like education and human services. Changes to the Hospital Provider Fee also took the heat off its main beneficiaries — hospitals and the state’s Medicaid program — which were being blamed in recent sessions for pushing the state over the TABOR cap. Hickenlooper does not appear to be using his final budget to advance new, high-profile initiatives. Instead, the outgoing administration aims to provide a well-funded budget and rainy day fund, giving a smooth handoff to Hickenlooper’s successor. Legislators, however, could find an opportunity to finance their favorite programs thanks to the governor’s budget intentions and the relatively sunny financial picture. Behavioral health includes mental health and substance use treatment, and this area — especially substance use — will be a major focus. It’s in the legislative spotlight because of a growing body of data about drug overdoses, which have increased in every Colorado county over the past decade, fueled by a sharp rise in opioid addiction. The solid bipartisan support for addressing the problem is unmatched by most other big-ticket health topics. After the 2017 session, the legislature assembled a 10-member bipartisan interim committee to research and draft bills related to opioids and other substances. The committee, chaired by Rep. Brittany Pettersen (D-Lakewood) and Sen. Kent Lambert (R-Colorado Springs), recommended six bills for introduction. These bills, which do not yet have numbers, tackle drug use on several fronts. While all but one carry a price tag for the state, there’s enough momentum around the issue to give the bills a real chance to pass. Bill A would establish the bipartisan group as a year-round study committee through 2023. It also calls for more continuing education for providers about safe prescribing of opioids and allowing school-based health centers to fund substance use treatment. Bill B would limit opioid prescriptions for most conditions to no more than seven days’ worth at a time, and would require prescribers to check patients’ history using the prescription drug monitoring program before issuing refills. Bill C would permit the opening of a supervised injection facility, where heroin users can take the drug in a safer setting. These facilities are under consideration in several states but do not yet exist anywhere in the country. The bill also would allow county and district public health agencies and hospitals to provide better access to clean syringes for drug users. Bill D would add licensed clinical social workers, professional counselors, clinical psychologists and others to the list of health care providers eligible for the Colorado Health Service Corps program, which helps repay student loans of those who work in rural and underserved areas. Additionally, it would create a scholarship program for certified addiction counselors in high-need areas. Bill E would direct Colorado’s Medicaid program to seek a federal waiver to receive matching funds for residential and inpatient treatment for substance use. Bill F would allow health professionals to prescribe medication-assisted treatment for Medicaid enrollees and those with private insurance without first having to seek approval from insurers. CHI has been heavily involved in research on opioids and substance use since last spring, including as the lead author of a report mandated by HB 17-1351 to study the feasibility and impacts of adding an inpatient treatment benefit through Medicaid, which was subsequently recommended in Bill E (above). Legislators will debate a renewed effort to require more transparency from hospitals, specifically about their finances. Hospitals successfully opposed a 2017 bill backed by the governor’s office that would have forced them to open their books for wider public inspection. The Colorado Hospital Association recently released some of the data requested in that bill, but legislators are poised to ask for more. Sen. John Kefalas (D-Fort Collins) will once again propose legislation to regulate freestanding emergency departments, which are more prevalent in Colorado than anywhere else in the country except Texas. Similar efforts have failed since 2014. Federal rules against discouraging people from utilizing emergency care centers have complicated attempts to warn patients about the costs associated with these facilities, and a temporary moratorium on building new FSEDs — included in Kefalas’s 2017 defeated bill — went too far for some people. The issue of surprise medical bills is also rumored to be back, after the 2017 session saw little attention paid to it. High charges often result when patients are treated at an in-network facility but, without their knowledge, by an out-of-network provider. Legislators could push for more consumer protections. Insurance prices, especially on the individual market, consistently hold a place in Colorado’s health policy conversations. Mountain-area legislators will try again to flatten premiums by switching the state from its current nine geographic rating regions for insurance to just one, despite a 2016 opinion from the Division of Insurance (DOI) that the plan would not work well. Rep. Millie Hamner (D-Dillon) and Rep. Bob Rankin (R-Carbondale), who sit together on the Joint Budget Committee, continue to hear horror stories from their constituents about extremely costly premiums that some simply cannot pay. There will undoubtedly be other conversations about premiums and affordability. For example, Senate Health and Human Services Committee chair Jim Smallwood (R-Castle Rock) plans to sponsor legislation to provide relief for individual market customers, and county commissioners who live outside the Front Range continue leading conversations about local or regional solutions. The DOI completed a study last fall, mandated by SB 17-300, looking at the feasibility and potential impacts of a state reinsurance program or other method to control costs. Reinsurance is essentially insurance for insurance companies to protect them against very high-cost claims, and it has made national headlines for its success in Alaska. While it seems a promising method to lower premiums across the board, the big questions will be: What’s the cost, and how would the state pay for it? These efforts focus on a relatively small portion of the state’s population — the eight percent who buy their insurance through the individual market. While that’s a significant number, more Coloradans are affected by changes to public insurance. Legislators such as Rep. Susan Beckman (R-Littleton) have expressed concerns about the role of government in providing insurance coverage to so many residents, and many others are troubled by the growing costs of public programs, especially Medicaid. Legislators could request changes to how Health First Colorado is administered, which would require approval of a federal waiver request. Transparency is a hot topic going into the session. Rep. Mike Foote (D-Lafayette) will sponsor a bill that would mandate broad pricing transparency in the health care system through a detailed list of charges, both online and in print, available at health care facilities throughout the state. This effort is sure to draw industry opposition, and supporters have already said that if it doesn’t pass, they plan to try putting it on the ballot for the next statewide election. Pharmaceutical price transparency is also contentious. After two failed attempts at mandating transparency across drug types, Rep. Dylan Roberts (D-Eagle) – newly appointed to replace Rep. Diane Mitsch Bush of Steamboat Springs, who left to focus on her congressional campaign – will propose a narrower approach: requiring pricing information for diabetes drugs only. An early-session effort will focus on passing the Enhanced Nurse Licensure Compact, an agreement that has already been approved by the majority of states. If passed by the legislature just eight working days into the session (January 19), registered nurses in Colorado with a multistate license will be grandfathered into a new agreement. Otherwise, they will be subject to another round of fingerprinting or federal background checks. The bill has bipartisan sponsorship and a long list of supporters. Several legislators will continue working to improve suicide prevention efforts. Suicide is the leading cause of injury death in Colorado, and the state has experienced a stubbornly high suicide death rate for years. Strengthening prevention efforts is likely to draw bipartisan backing. And multiple bills are lined up to broaden protections for sexual assault victims. This issue is hitting especially close to home for state legislators after several sitting lawmakers have been accused by staffers, lobbyists and fellow legislators of sexual harassment at the capitol. Finally, a ban will be proposed on step therapy for patients suffering from advanced cancers. Bills banning step therapy — where patients must try the generic version of a drug and prove it does not work before taking a specialty drug — have faced opposition from insurers in recent sessions. Colorado is in the final days of open enrollment for private insurance — a period that has already ended for most other states, but was extended here to January 12. Policymakers are eager to see how the state fares in terms of sign ups during the Trump administration, which has worked in several ways to limit enrollment in ACA coverage. They also want to know if the state marketplace, Connect for Health Colorado, will prove to be financially sustainable. The marketplace has critics as well as supporters in the state legislature, and its leadership appears regularly before the state Health Insurance Exchange Oversight Committee. There is also a great deal happening in Congress that may affect health coverage, services and the budget in Colorado. The ACA survived several attempts last year to repeal and replace it, but that doesn’t mean Congress and the Trump administration won’t chip away at the law through altering or repealing important provisions, such as funding for outreach and education efforts during open enrollment. Health policy stakeholders will be watching to see what plays out this year, and how much the ACA is featured in other high-profile debates. And the tax reform plan passed by congressional Republicans in December may have seemed outside the health care realm, but several big pieces of the bill will directly affect the insurance market. Chief among them is the repeal of the individual mandate, which has required most people to purchase insurance coverage or pay a penalty. Estimates vary for how much this will affect insurance premiums and coverage levels across the country. State legislators could consider ways to mitigate the impact in Colorado. Of special concern for health care stakeholders: funding for the Children’s Health Insurance Program (CHIP), which covers about 75,000 kids and pregnant women in Colorado, and funding for community health centers. Both have been waiting for renewed approval since last September, and there would be major fiscal and coverage implications if Congress does not act soon. 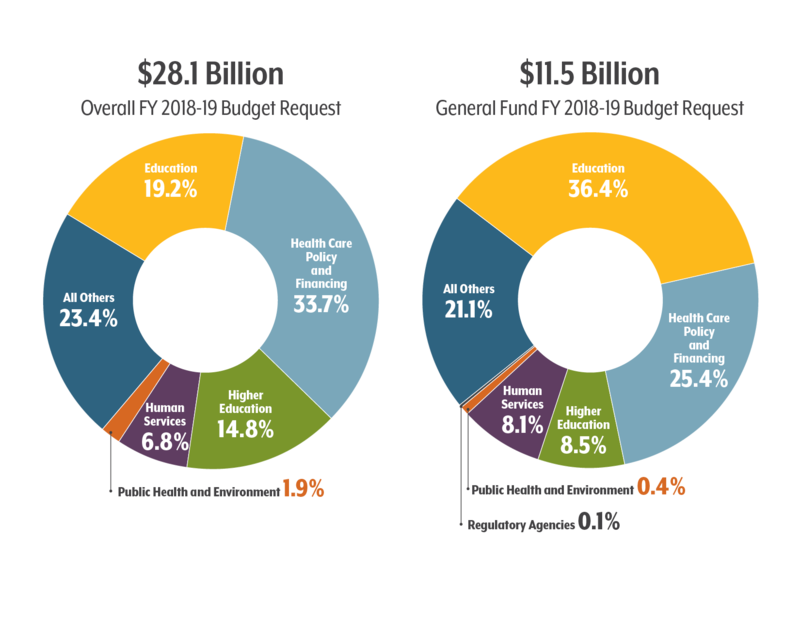 The newest stopgap budget includes reduced funding for CHIP (CHP+ in Colorado) through the end of March and temporary funding for health centers, but does not offer a long-term extension for either program. The national Prevention and Public Health Fund is also facing cuts. If agreements aren’t reached, state legislators may be tasked with approving emergency supplemental funding. In late December, the JBC approved such funding to extend CHP+ for one month if needed. Lawmakers may be asked once again to pick up the tab if Congress doesn’t act. So far, legislators seem willing to act, but their pocketbooks may be limited. The 2018 session should be viewed as the start of a transition to a new governor. As the session begins, expectations for major policy breakthroughs are moderate, at best. However, legislators do hope to address the substance use and overdose epidemic. The party primaries in June and general election in November should bring clarity on the future direction of Colorado politics — a better definition of the Democratic and Republican party coalitions and, crucially, the priorities of the new governor. Even though health policy may not advance much this year, look for a lot to change politically. By this time next year, Colorado’s health policy landscape could look very different.